New Jersey- Even though the world economy continues its downward slump, many people who make a living speaking and or writing could in fact be making more than ever. Those looking to break into the market or simply improve their personal, scholastic, or business skills can achieve superlative results! , Craig believes he offers real world solutions to the obstacles most encounter. Craig, renowned lecturer (with one time Grateful Dead member Tom Constanten and America’s Rock & Roll Photographer Don Aters) and author of celebrated rock biographies Take Me To A Circus Tent (Jefferson Airplane) & Have You Seen The Stars Tonite (Jefferson Starship), believes his latest tome can help just about anyone improve their communication skills. He is confident it can give even the greenest writer or speaker the skills of a seasoned vet if they devote the time and show the will to succeed. Craig has put together a comprehensive audio training package, so you can listen to the examples and learn as you go. The 273 page book also contains what Craig Fenton believes is the first of its kind: a reverse spelling dictionary (doesn’t give you the meanings) including 3497 words that can be looked up with the incorrect and correct spellings. Painting My Room In A Colorful Way promises to help people overcome many of the most common speaking and writing issues. Many people are simply afraid to speak in public, fearing ridicule, mistakes in their delivery, or even worse. Craig's book teaches speakers how to overcome those things and more in the most natural way possible. There are also useful sections (naming only a few) on smoothing out accents, how to be topical in the local your speaking, knowing how and when to insert humor, and building your speeches correctly to win the audience over. 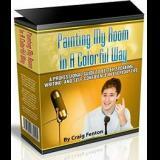 Painting My Room In A Colorful Way costs $197 and includes the book, an audio package, and full phone, and email consulting from Craig Fenton himself. Craig is applying a maximum ownership limit to ensure than every single person gets the most out of their consultation period with him. Painting My Room In A Colorful Way is the ultimate guide to better speaking, writing, and self-confidence with a book, audio files, email support, and phone coaching. With a price that won't leave you speechless. Includes a money back guarantee. Created by Craig Fenton public speaker, former radio personality, and the author of the Jefferson Airplane book Take Me To A Circus Tent and the Jefferson Starship Have You Seen The Stars Tonite.